Princess Charlotte was born on 2nd May 2015 and is the fourth in line to the British throne, after her father, Prince William, and her elder brother, Prince George. Her full name is Charlotte Elizabeth Diana, with the Diana in memory of Prince William's mother. She will be known formally as Her Royal Highness Princess Charlotte of Cambridge. 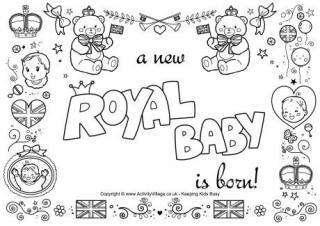 Learn to spell and write the name of our little princess, Princess Charlotte, with this fun handwriting worksheet, then colour in the flowers. Here's a pretty picture of Princess Charlotte in a very smart outfit, ready for the kids to copy along with until they have their very own picture. It's a fun way to learn to draw, especially for children who need to build confidence in their drawing skills. Choose one of the four printables below to write your P-R-I-N-C-E-S-S acrostic poem. A little tricky, perhaps? Here is a colouring page of the little Princess Charlotte - aged very nearly 3! Children can practice their handwriting by tracing over the letters of the little Princess Charlotte, then having a go on their own. Available in colour or black and white. Princess Charlotte is always happy to wave to the crowds and photographers, just like she did when she went to meet her new baby brother! Princess Charlotte, who is very nearly 3 in this poster, waves at the crowds (who can't help but fall in love with her) as she goes to meet her new baby brother! Wherever lovely Princess Charlotte goes, she's always the centre of attention! Use this story paper to write down some facts about her or perhaps you could write about what you think a day in her life is like? The children will love finding out more about the adorable Princess Charlotte for this fun worksheet! In 2018 Princess Charlotte became the first female royal to retain her claim to the throne, despite the royal baby being a boy. Will the new royal baby be a prince or princess? We are prepared either way!